output characteristics. The sensor housing has been designed specifically to reduce package induced parasitic stress and strain. In addition the sensor utilizes a silicon, micro machined (MEMS)structure to provide a very linear output to measured pressure. 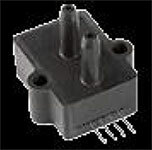 The sensor embodies a vacuum reference. All parameters are measured at 5.0 volt excitation for ratiometric parts and 12.0 for parts with internal reference, for the nominal full scale pressure and room temperature unless otherwise specified.